Comfortable Florida Elegance at its Best. 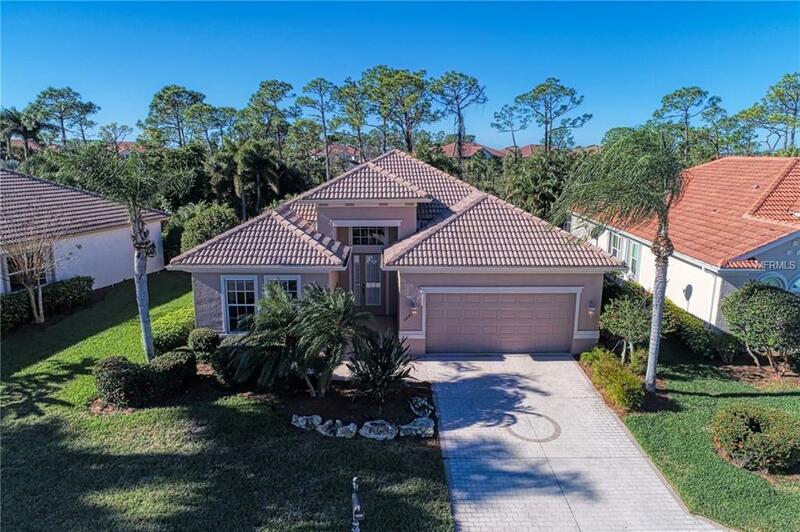 2 Bedroom, 2 Bathroom, 2 Car Garage with Heated Salt Water Pool Home located in the sought after Gated Golf Course Riverwood Community. The Great room & Dining room, Lanai, plus Den offer generous spaces for Entertaining and Family Living. Den could become third bedroom with room to add closet. Enjoy cooking in this Superb Kitchen offering Quality Wood Kitchen Cabinets, Counter-tops, Appliances (2014) and Breakfast Bar with extra seating. Spacious Master Bedroom and Bathroom with His and Her Vanities, Walk In Shower and Lovely Garden Bath is sure to please. Head out the Sliding Glass Doors and relax on the Decorative Engraved Lanai or take a Swim in your Heated Salt Water Pool. All surrounded by a Picturesque Nature Preserve that offers Desired Privacy. Exceptional features that will excite the most discerning buyer such as Tray Ceilings, Plantation Shutters, Convenient Furnishings and so much more! COMING SOON: NEW RESORT STYLE POOL, SEPARATE FITNESS CENTER, PICKLEBALL COURTS, NEW SMALL AND LARGE DOG PARKS! Enjoy all that Riverwood has to offer in our lush tree lined streets, renovated activity ctr w/all the activities offered. Audubon Green Community Award Winner for its natural habitat for Florida Wildlife. Optional amenities: Dog Park, Rwd Golf Club, Par 72 Championship course & Beach Club on Manasota Key. Close to boating, cultural events, dining, shopping & beautiful beaches of SWFL. Located between Sarasota & Ft Myers on Floridas West Coast in Paradise! Amenities Additional Fees Golf Club Membership is An Additional Fee Please Visit Www.Riverwoodhp@Riverwoodgc.Com For More information. Beach Club Membership And Dog Park Usage Are Also An Additional Fee.